Footshooter is the moniker of London based producer, DJ and musician Barney Whittaker. His style blends skippy, broken beat production with live instrumentation to create an organic, rich sound and he frequently collaborates with emcees, poets and vocalists exploring different tones and moods. His last record, Strange Days EP (released on Famous Friends), gained regular plays on NTS, Balamii, WorldWide FM and, most recently, by Bonobo in a DJ set at his NYC Boiler Room. 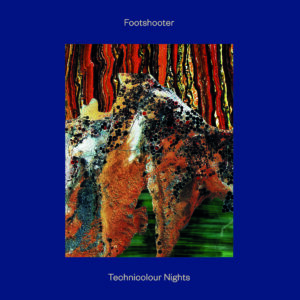 'Technicolour Nights', due out on YAM Records later this year, is a meditation on long evenings & nights out and how they vary in atmosphere, mood and colour. Opening with the aptly named and ethereal 'Intro', the EP quickly jumps into sunshine territory with 'Juan's Stairwell' before 'On Telegraph Hill' brings the heads down for a meditative two-step groover to close up the A-side. On the flip, Footshooter flexes his 160bpm muscles on 'Mars' with the help of London based vocalist and MC And Is Phi, before dropping the tempo just a touch on 'Rotations', a steppy, Rhodes-laden journey through London nightlife. 'Our Love' lowers the tempo even further to bring the EP to a close on a bittersweet note.